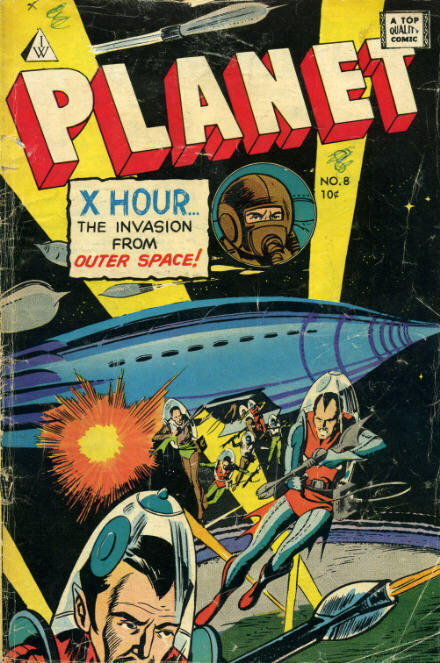 For a few years in the 1970s the Australian comic company K.G.Murray called themselves “Planet Comics”. Most of their monthly magazines contained 96 pages of American reprints in black and white. The Bumper Batcomic ran for 20 issues in this format although K.G.Murray had printed Batman reprint comics in one form or another since the late 1940s.This issue is from May 1977. What is even more surprising is that it wasn’t just DC comics they reprinted. There were many many Charlton comics reprinted in Australia. There were issues of The Peacemaker, Captain Atom, Unusual Tales, Vengeance Squad…even Haunted Love !! 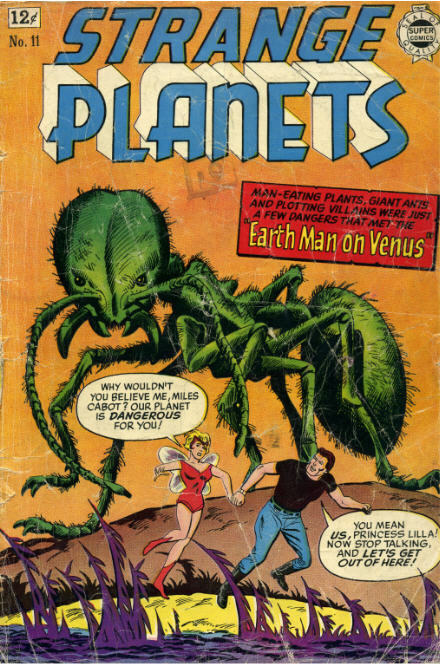 I like this issue of Planet Comics featuring Ditko at the height of his powers. I’m unable to identify some of the back-up stories. They are too gruesome to be from Charlton or DC. They look too modern to be pre-code. I suspect they may originate from Skywald or even Eerie Publications. Incidentally, during the 1970s K.G. Murray also produced Australian editions of Warren’s Creepy, Eerie and Vampirella. The “Terror Tales Album” comics are a mixed up medley of DC and Charlton horror stories. Over these two issues the terror tales are introduced by just about every “host” that the two companies used across all their different titles through the 1970s !! For further information on comics Australian style head over to this site and all will be revealed. PS: This advert was on an inside cover. Evidentally locally drawn, is that really Supergirl ?? I seem to have a few of these semi-legal IW (later to call themselves Super) Comics. At least in the USA they were often sold as three comics in a plastic bag for 25 cents. Gold Key employed a similar means of using up unsold back-issues. 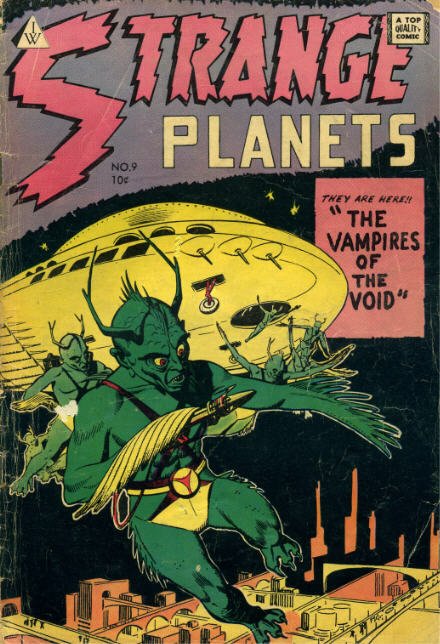 There was a Planet Comics No 1 but strangely the next issue was No 8. You open the cover of Planet No 8 and where there should be the splash page is a full page advert! I’m not even sure if its a current advert or the ad that appeared in the original comic that is being reprinted!! 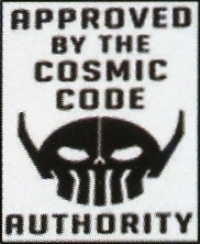 Theres no Comic Code Stamp either. Just Mr Waldman’s bold claim that you’ve got a “top quality comic”. What you’ve actually got is ancient reprints from “Fiction House”, or “Avon” or some other defunct Golden Age comic company. Israel Waldman was doing just what Alan Class was doing in the UK…buying old plates and printing whatever was on them …horror..funny animals… IW/Super comics appeared sporadically between 1958 and 1964. Mr Waldman would re-appear a few years later as the second half of SkyWald. 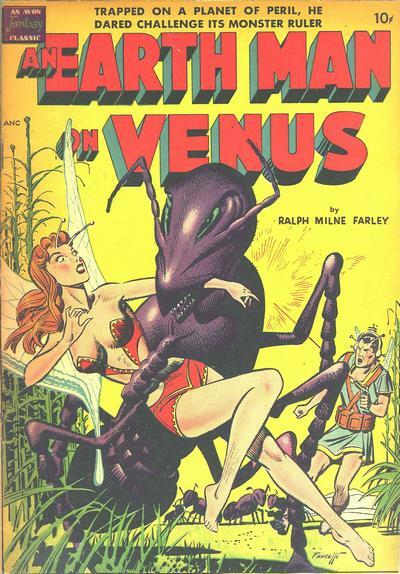 Strange Planets 11 from 1964 reprinted the entirity of Avons 1951 one-shot “An Earthman on Venus” drawn by Wally Wood. It did however boast a new Andru/Esposito cover with a similar theme to the original comic.